Investment in green finance is surging making it a matter of competitiveness for companies and countries. Last year, total investment in green bonds nearly topped $600 billion, more than double the value of the previous year. Yet, despite this impressive growth, investment levels were still an estimated $400 billion short of global need. 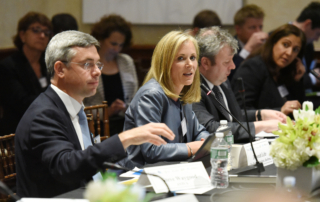 To examine how to address this outstanding shortfall, Basilinna supported the hosting of the third meeting of the “Greening the Financial System” on April 20 in Washington, D.C. This event brought together leaders from the private, governmental, and non-governmental sectors to discuss the future of green finance, with a focus on incentivizing issuers and investors to increase private capital investment in green finance, and increasing the competitiveness of green finance through financial innovation. The event demonstrated that while interest in green finance is increasing amongst traditional financial sector clients, the market is still struggling to get to scale. Two obstacles were identified as preventing greater levels of investment. First, the market is currently unable to price effectively the long-term effects of failing to convert to a low carbon economy. Participants suggested that this could be addressed by adopting a standardized system of disclosure of investments’ environmental impact, but high levels of skepticism regarding how governments should support for green finance is a barrier to catalyzing change. Often government risk from policy changes is a challenge. A second issue that is inhibiting the growth of green finance is the misalignment between sources of financing and the pipeline for green infrastructure projects. Creative ways to overcome the idiosyncratic risk of cross-border investing in long-term projects are needed; one proposed solution would be to shift the role of multilateral banks towards bringing in private sector funding, in addition to just directly investing through functions like guarantee programs. Participants focused on offering tangible steps to enable further growth in green finance. Both opening speakers in the first panel, entitled “Incentivizing Issuers & Investors,” highlighted the importance of disclosure to drive changes in investment patterns. Disclosure was viewed as a prerequisite for markets to function effectively in pricing the cost of climate change and green finance. The speakers also suggested that greater space for risk sharing between the public and the private sector existed, with one speaker noting that the private sector would not take certain risks without support from the public sector, and that a reassessment for how to leverage public and multilateral money to ‘crowd in’ private sector funding was necessary. And there was general agreement that governments should provide incentives to promote private sector investments. Finally, the panel discussed strategies that governments could take from a regulatory perspective. While some disagreement as to the exact extent of government intervention existed, ideas like subsidizing green verification, loss protection, and carbon pricing were noted. However, while acknowledging the potential role of specific policy interventions, the panel participants suggested regulatory and financial factors would play a greater role in growing green investments. Overall, the panel, which included senior bankers, regulators, and government officials, projected a positive outlook. One participant described green finance as having reached escape velocity, suggesting that the challenging step of proving the proof of the concept of green finance had been completed and that it was now time to scale. The second panel, “Green Finance and Competitiveness” was chaired by Deborah Lehr, CEO of Basilinna and a Senior Fellow at the Paulson Institute. Similar to the first panel, the participants were positive about the overall progress and trajectory of green finance. A senior banker pointed out that a bank found that the risk-weighted return of green investments was greater than lending in traditional markets. Members of the panel also stressed that there is increasing competition at the national level between China, Britain, and Luxemburg to become the hub for green finance. Even more encouraging than general interest by countries in this market, Britain and China have also established multiple working groups to further develop innovative financial tools and expand green finance. Finally, the panel highlighted Singapore’s new loan verification guarantee system that reduced the transaction costs of determining a bond’s environmental impact, thereby increasing private lenders interest in labeling investments as green. Shanghai is planning to roll out a similar initiative in the near future. Both panels highlighted the progress that has been made in developing green financial markets over the last year and the necessary next steps. Another conference focused on the “Greening the Financial System” will meet again later this year on the margins of the Fall IMF/World Bank meetings, and hopefully will demonstrate continuing momentum. The private sector will play an indispensable role in reducing environmental impact so it is important that government policies and innovative structures are created to support and encourage its involvement. We look forward to this group, composed of supporters from the Paulson Institute, the Institute of International Finance, SIFMA, Bloomberg Philanthropies and the United Nations Environmental Programme, continuing to catalyze awareness and change.